Ralph Lauren is transporting his most exquisite car collection to the Musée des Arts Décoratifs in Paris for a special exhibit called “The Art of the Automobile: Masterpieces from the Ralph Lauren Collection”. 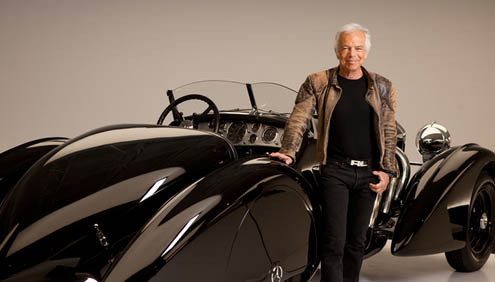 Stylish not only in clothing but also in automobiles, world renowned designer Ralph Lauren has established himself as amongst one of the world’s major car collectors. His impressive collection includes a 1938 Bugatti, a 1958 Ferrari Testa Rossa and a 2010 Lamborghini Murielago, making Ralph Lauren’s range of cars ‘a museum of automotive history, an archive of performance machines that represent the finest achievements in motorsport’. From the 28th April, a selection of Ralph Lauren’s most prestigious sports cars from the 1930s to the present day is on show for the first time in Europe at Paris’ Musée des Arts Décoratifs. 17 outstanding cars, chosen by the curator Rodolphe Rapetti, outline the main phases of European automobile history. With this collection Ralph Lauren shows that the automobile is a major art form created by the industry’s biggest names: Bugatti, Alfa Romeo, Bentley, Mercedes-Benz, Jaguar, Porsche and of course, Ferrari, the high point of this unique collection.